The Psilocybe cubensis McKennaii has become very popular of late. 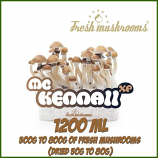 McKennaii is a relatively new strain of cubenses and is one of the most powerful species. It is even more powerful than the well-known Hawaiian. The McKennaii is somewhat more delicate to grow. It is named after the famous American philosopher, psychonaut, researcher, lecturer and writer Terence McKenna. If you would like to experience a strong visual and intense philosophical trip, the McKennaii will not disappoint you! 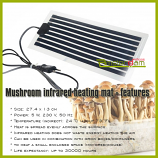 Due to the quality of the Freshmushrooms mushroom, the active substance content in this mushroom is significantly stronger than the traditional grow kits.